Includes iron-on patch and download card for the Rubble Kings documentary. 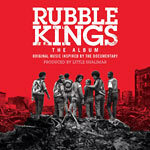 The Album is a soundtrack of music inspired by the movie Rubble Kings. Produced by longtime Run The Jewels collaborator Little Shalimar, the album features appearances from Bun B, Ghostface Killah, Killer Mike, Tunde Adebimpe, Mr Muthaf*kin eXquire, Boldy James, Cuz Lightyear, Ka and Roxiny, in addition to Run The Jewels.